Some LA restaurants will host a dinner complete with a service led by a rabbi, while others offer ready-to-serve meals of brisket, lamb and vegetables that should be ordered in advance to take home. Learn more by contacting the establishments on GAYOT’s Top Passover Restaurants in Los Angeles. 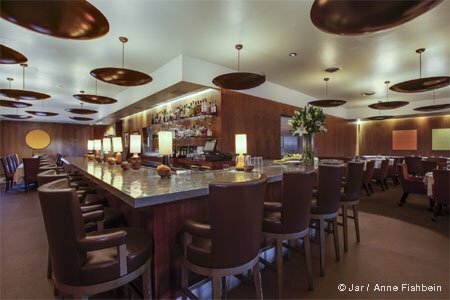 Also, check out GAYOT’s Best Kosher Restaurants in Los Angeles. 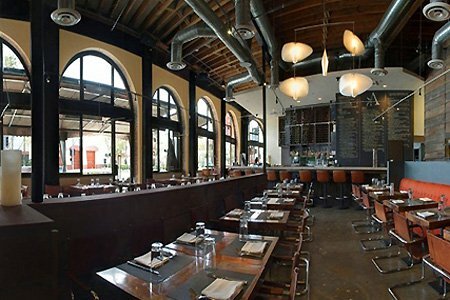 In the historic Hull Building in downtown Culver City, Akasha will offer Passover Seder on Saturday, April 20. Author and spiritual leader Rabbi Mark Borovitz of Beit T’Shuvah will preside. A reception (6:15 p.m.) precedes Seder and dinner (7 p.m.), which will include dishes such as Akasha’s matzoh ball soup, red wine-braised brisket, and dessert presented family-style. Cost is $110 for adults (includes wine or juice, coffee or tea) and $55 for children under 10 (includes juice). 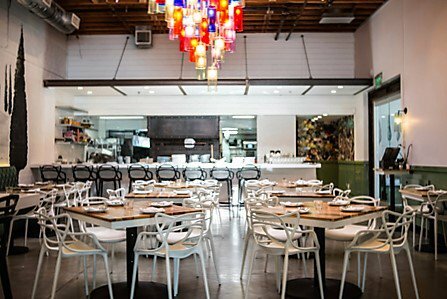 Celebrate Passover at AR Cucina in Culver City. 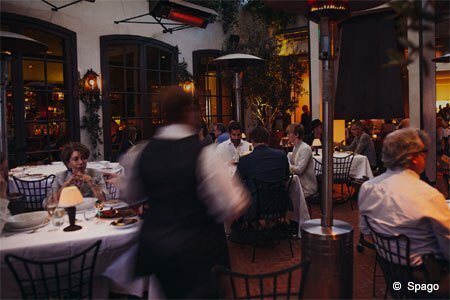 From 5:30 p.m. to 10:30 p.m. on Friday, April 19, and Saturday, April 20, the restaurant will complement its regular dinner menu with holiday specials such as matzoh lasagna with spinach and ricotta; grilled lamb chops paired with vegetables and Sardinian olive oil smashed potatoes; and Passover cookies. Art’s Delicatessen & Restaurant in Studio City will accommodate Passover dining from Friday, April 19, to Saturday, April 27. 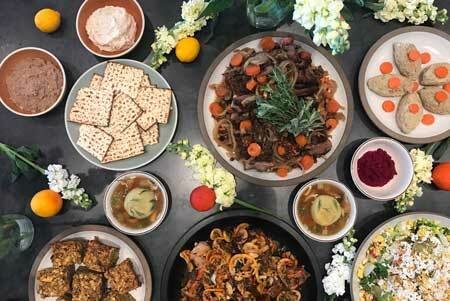 A special Passover restaurant menu will feature a set dinner ($47 per person) as well as à la carte selections such as a gefilte fish appetizer ($10), brisket plate ($26) and mini macaroon cookies ($13). The regular menu will be offered, too. Take-out options include whitefish salad ($24 per pound) and grilled salmon filet ($20 each). A set dinner ($47 per person) is also available. This traditional New York-style deli on Pico Boulevard offers a catering menu for Passover, from April 19-27. Pick from chicken soup ($7 pint, $11 quart, $18 half gallon); braised short ribs ($22); honey cake ($13, one pound loaf) and a seven-inch almond torte ($17), and more. A three-course Passover dinner is priced at $29 per person. These items are available for pick-up and delivery. The restaurant is open during Passover week, closing at 4 p.m. on the 19th and 20th. Chef-owner Suzanne Tracht’s California chophouse offers Passover Seder on Friday, April 19, at 5:30 p.m.
Officiating the Seder service will be Rabbi Ellen Nemhauser, with the four-course dinner to follow. Guests will encounter tray-passed items, then choices such as butter lettuce salad with asparagus, radish and egg; and sautéed Alaskan halibut. The meal ends with lemon cheesecake, chocolate covered matzah and ice cream sandwiches. Cost is $120 for the menu, coffee, tea and Passover wines; $55 for children 12 and under. 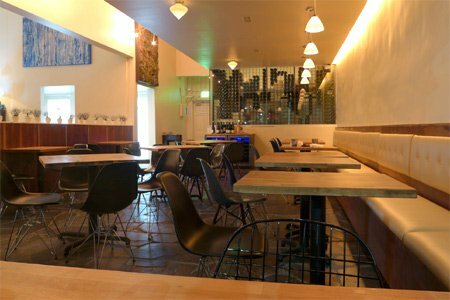 Larchmont’s Kali will offer Passover dinner on April 19-20. The family-style meal starts with matzoh ball soup and moves on to ancient grains and shaved radish, shawarma spiced lamb shanks, chocolate macaroon cake and more. Cost is $70; à la carte is available, too. 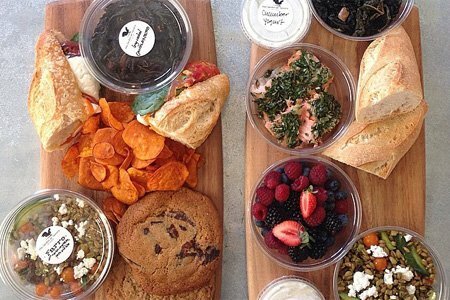 Enjoy Passover dining at home with the help of take-away fare from chef Suzanne Goin and business partner Caroline Styne’s The Larder at Tavern. The special menu is available from Friday, April 19, to Saturday, April 27 (orders require 48 hours’ notice). Compose a meal with the likes of deviled eggs ($12 for a half-dozen), braised beef brisket with horseradish jus ($56, serves four) and coconut macaroons ($18 for a dozen). 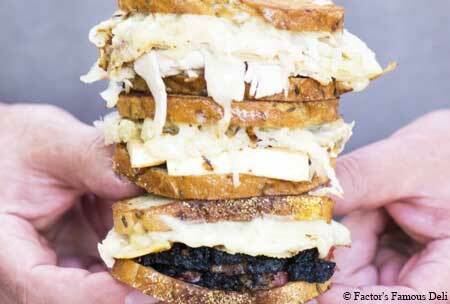 Nate ‘n Al is a classic Brooklyn-style deli, only located in Beverly Hills. Passover menu items are available to order for take-out, delivery or pick-up. Options include gefilte fish ($6.95 each), noodle kugel ($8.95 a pound), roast chicken ($14.95 each) and chocolate-dipped macaroons ($14.25 a pound). 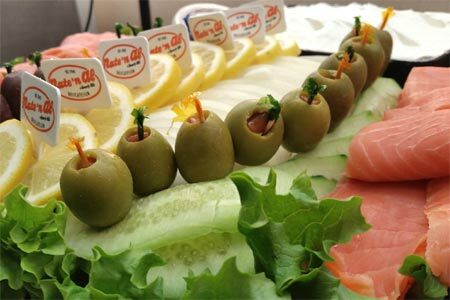 Make your Passover menu choices and get your take-out order in by April 9 to enjoy Pico Kosher Deli fare for the holiday. Pick-up is on Thursday, April 18, from 6 p.m.-9 p.m. at 8820 W. Pico Blvd. Consider appetizers of poached salmon and stuffed cabbage, entrées ranging from sliced brisket to grilled chicken breast, sides of potato kugel and sautéed veggies, and butternut squash soup. Saturday, April 20, will bring Spago Beverly Hills’ annual Seder dinner (5:30 p.m.; $195 per adult, $80 per child under age nine). The event will feature the West Los Angeles Children’s Choir. Pick up your Passover food at the Wexler’s Deli outpost in Santa Monica from Friday, April 19, to Sunday, April 21 (delivery is an option, too). The full dinner ($450, feeds 10-12 people) presents the choice of Jidori chicken or the restaurant’s traditional braised brisket (or both), along with accompaniments of house-made gefilte fish, matzo ball soup, Santa Monica farmers market salad, roasted carrots and rosemary potatoes. 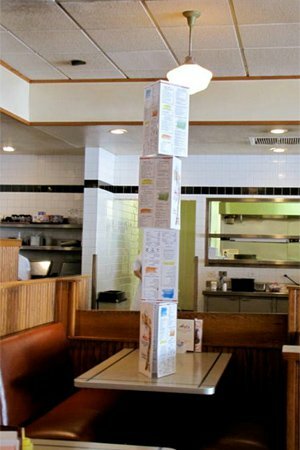 Customers can also order a half dinner for six people (pick one protein only). Everything is available à la carte; pre-ordering is required.